In this lab you will be using Ohm’s law to calculate the relationships of voltage, current, and resistance. Look at the circuit below. Using Ohm’s law, V = I X R, I = V/R, or R = V/I and calculate the missing values. 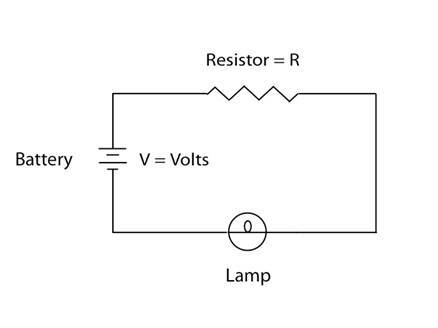 Your job is to calculate the amount of current that will get to each lamp given the different resistances below. A calculator may be valuable in this portion of the lab. For quick solutions I also Google "Ohms Law Calculator" and find many websites that have those calculators readily available. Notice the schematic of the circuit below and you see a complete circuit with the push of electrons and the pull of protons coming from the positive and negative poles of the battery. Notice the schematic symbol for a battery with the long and short parallel lines of the schematic symbol and you can also imagine the parallel plates of Alexander Volta’s bits of cardboard soaked in brine, holding and releasing an electron charge. Notice the circle with the loop of wire inside. This is the schematic symbol for a bulb and you can imagine this, as appearing like the filament inside a bulb. You already know the schematic symbol for the resistor the wavy line in the top part of the image below. 1 amp is the same as 1000 milliamps so when you do the math using amps just move your decimal place over 3 places to the right and you will have amps converted into milliamps. Solve the problems below. You can also calculate how many watts you have by using the formulas below. Resistors can be added together to create unique values. 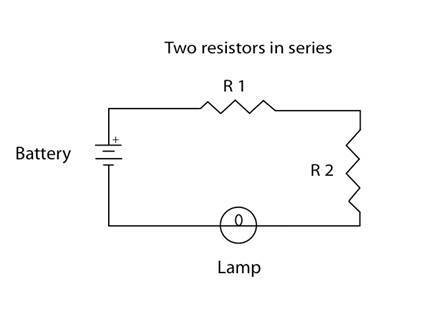 In a series circuit adding resistor 1 + resistor 2 would give you a total resistance that is the sum of the two. Therefore, if you have a resistor with 100 Ohms and another resistor with 1000 ohms the two resistors end to end in series would be 1100 Ohms. This allows you to create custom resistance values that you may not have in your electronic supplies. Now add some resistors in series on your breadboard and measure their resistances. Use the formula R1 + R2 to compute the values and compare these with your measured results. The schematic for a series circuit is below. 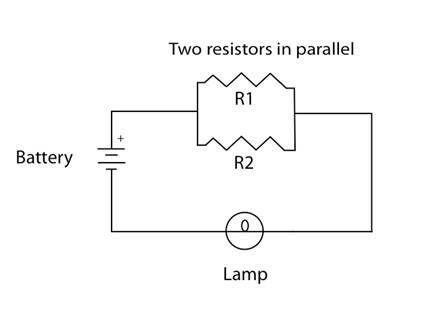 Here is an example of a schematic for a series circuit involving 2 resistors, a lamp and a battery. Use the white breadboard and create a few parallel circuits with some resistors and both compute the total resistance using the formula directly above and use your meter to measure your results. It is often wise to use your meter to confirm your resistor values as the colors are difficult to see clearly from one manufacturer to the next.